Janis Krums was heading out of New York at 20:23 last night after a busy day, “Leaving the city, had a great day. Trying to beat the traffic. Wish me luck!” he Tweeted. 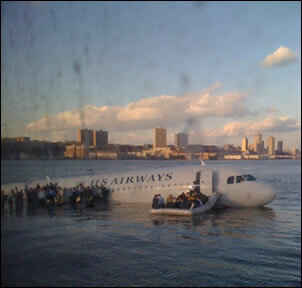 Thirteen minutes later he was in a position that he couldn’t have imagined – on a ferry rescuing the passengers of US Airways Flight 1549 that had just ditched into the Hudson River. How do I know? Janis grabbed a few minutes to put out a message on Twitter – and sent an amazing photo of the scene. A truly amazing experience to witness. Over the last couple of months we’ve written articles about how the mainstream media, in particular the newspapers, have been taking a pop at Twitter, attempting to tell their reads what a waste of time it is. Nick Curtis, the Evening Standard theatre critic (yes … theatre) dashed off a scantily researched piece saying it was rubbish, then, without any hint of irony, the Daily Mail slated it for how boring celebrities on it were. It would seem obvious that these papers have worked out that Twitter is a threat to them, further eroding people’s need for newspapers. Their behaviour mirrors their reaction to Blogging. It won’t have escaped you of course that every newspaper has multiple blogs these days. For us, concluding proof of the power of the people using Twitter and the threat that this presented to the news media was demonstrated by Janis Krums. The photo that he sent was better that any other photo that I’ve seen from any of the news services and their collective financial resource as they scrambled to cover it. There’s a fundamental difference between the enforced 140 char brevity of a Tweet and a Blog post. The expectation with blog is for a longer form content, something that can’t be considered in the situation that Janis was in last night. His attention was quite rightly focused in the moment – helping the people that were in danger. Having looked at Janis’ last two tweets, it looks like the news media – at least in the US – are learning to embrace Twitter. You can bet that news organisations the world over will be debating how they can harness Twitter, before it’s too late. Previous Previous post: PC iTunes Upgrade Failure: Wake Up Apple! Next Next post: Nokia N97 Touchscreen Smartphone Set For March Release?